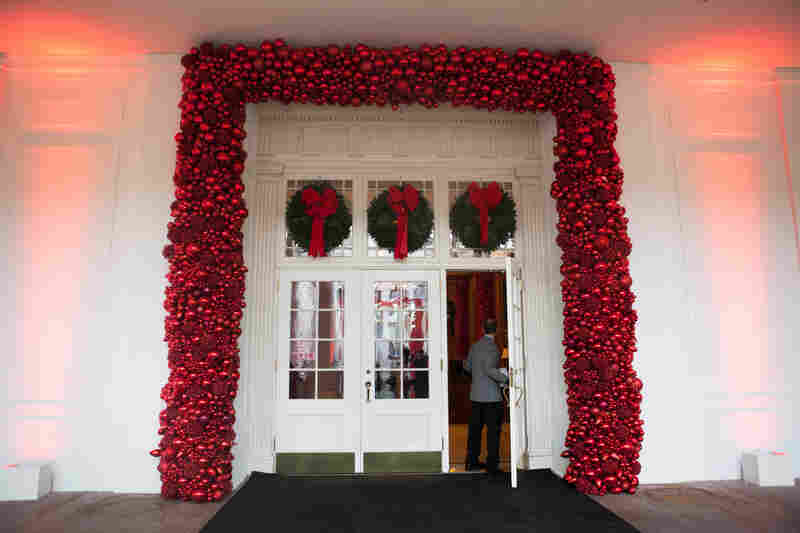 Wreathes and red ornaments adorn this entrance to the White House. 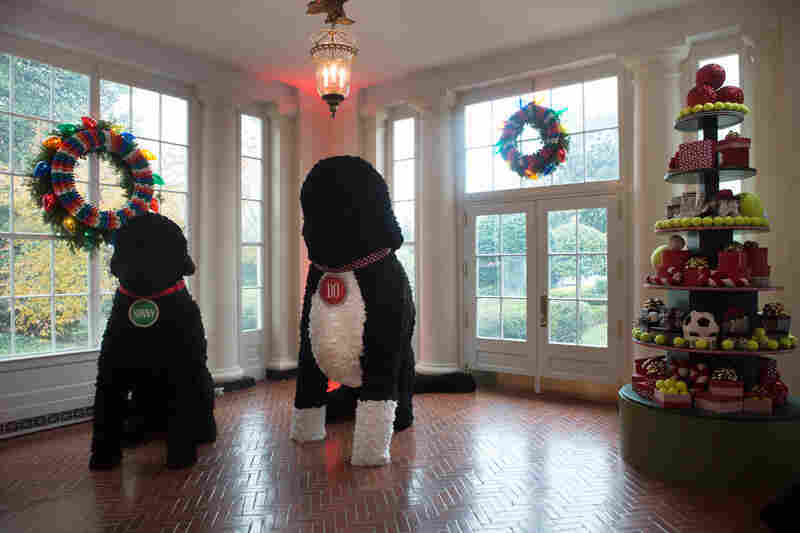 Larger than life replicas of Bo and Sunny made of yarn pom-poms guard the East Wing Hallway. More than 7,500 strands of colorful ribbon with crystal ornaments line the East Colonnade. First Lady Michelle Obama welcomes military families to the White House to view the 2016 holiday decorations. Ornaments on the tree in the White House library spell out the word "girls" in 12 different languages, paying homage to the First Lady's Let Girls Learn initiative. Fille means girl in French. 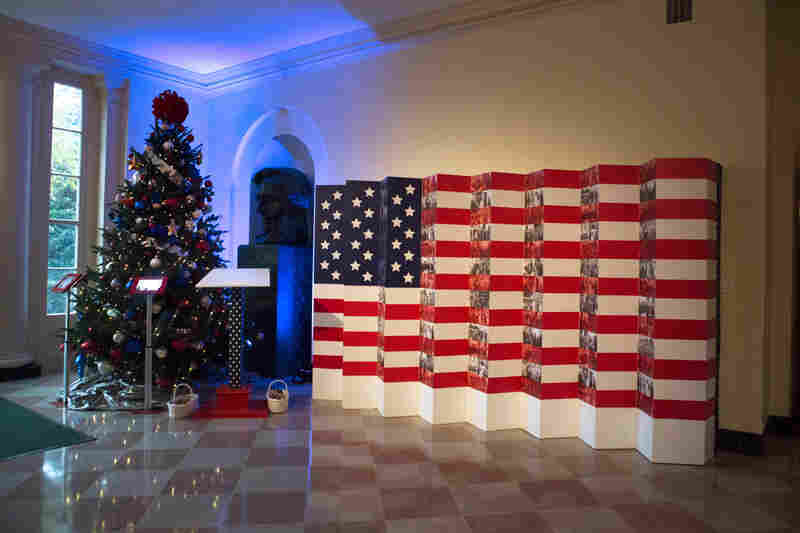 Inspired by the First Lady and Dr. Joe Biden's Joining Forces initiative, a giant flag installation features images of the First Family with military members. It's presented next to the military tree that is adorned with gold stars to honor the fallen and iPads with which guests can send messages to servicemen. 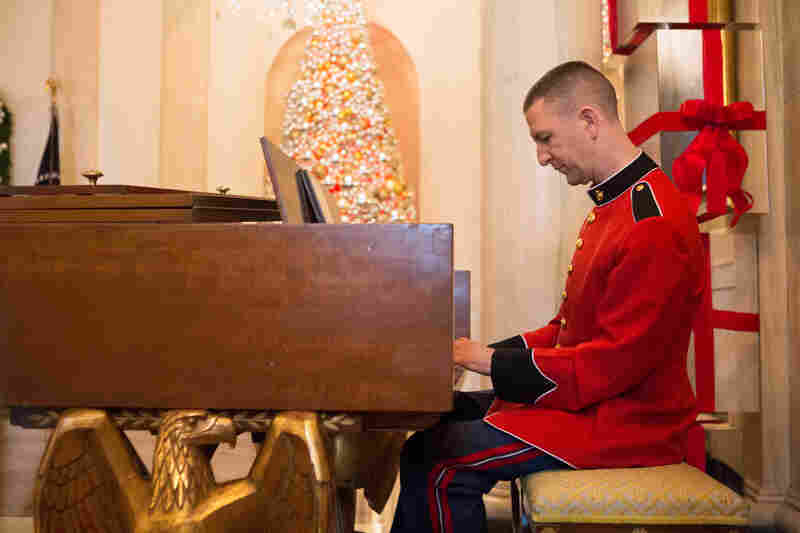 Gunnery Sargeant Russell Wilson from the United States Marine Band plays traditional Christmas songs in the Grand Foyer. 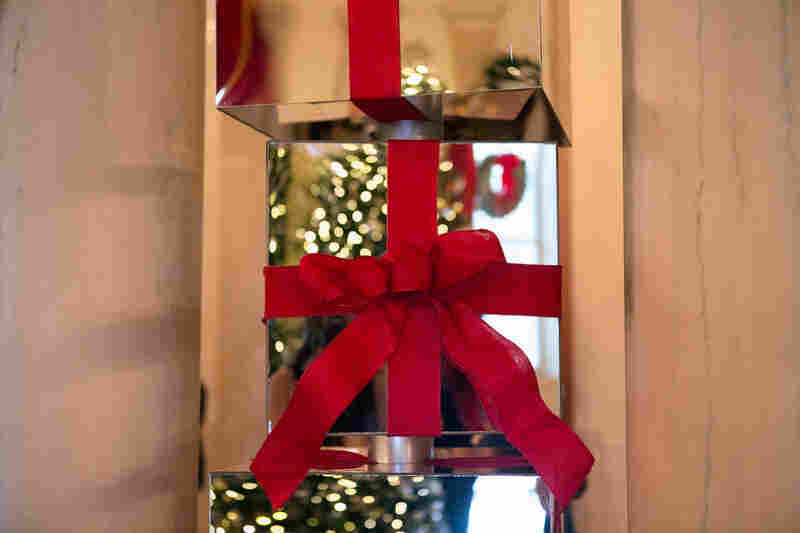 Mirrored presents are stacked in between columns in the Grand Foyer. The Grand Foyer is decorated with shiny presents and mirrored ornaments to fit its theme of hope and gratitude, "The Gift of Reflection." 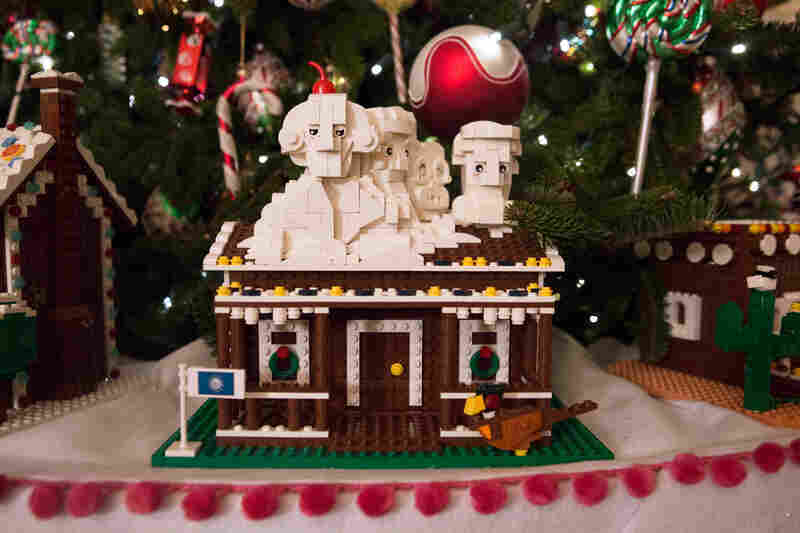 South Dakota's gingerbread house features Mount Rushmore and is one of the 56 one-of-a-kind Lego gingerbread houses--one for each state and territory. 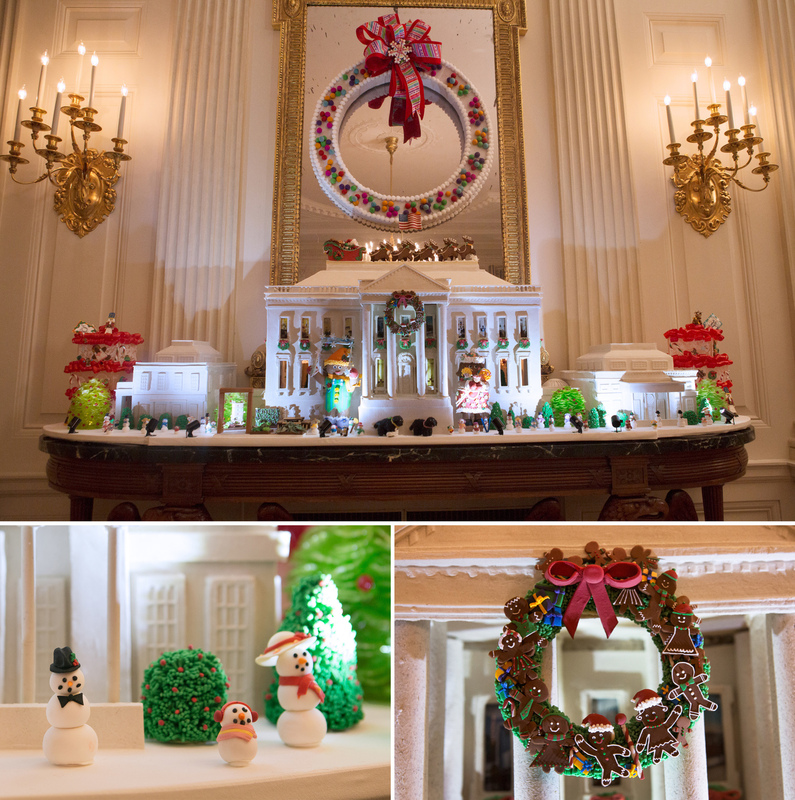 It took more than 200,000 Legos and 500 hours to build these decorations for the State Dining Room. White House staff sets up the Grand Foyer to receive the military families who will be the first guests to see this years' holiday decorations. 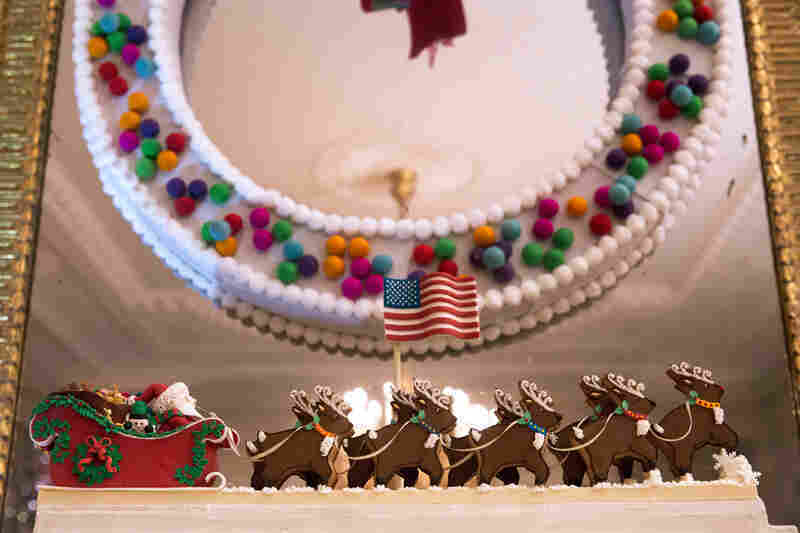 The top of the White House Gingerbread House features Santa in his sleigh with his reindeer leading the way. 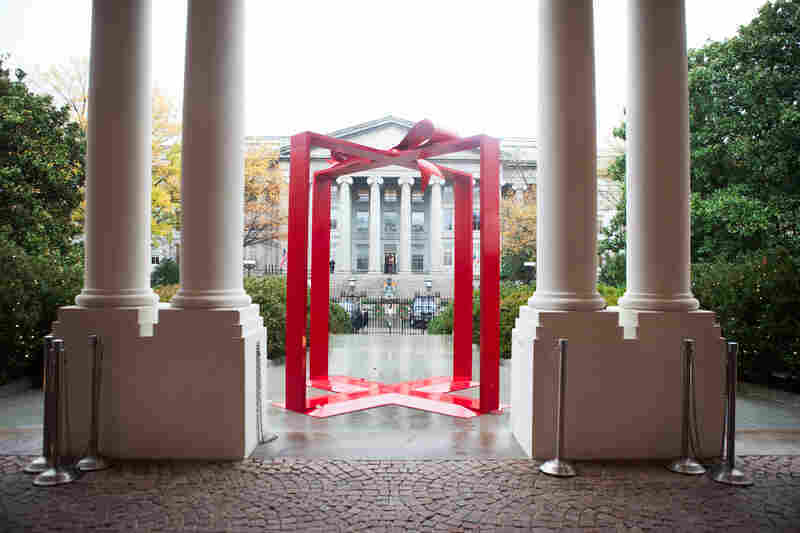 Following this year's White House holiday theme, "The Gift of the Holidays," the first thing guests see when they arrive at the East Visitor Entrance is literally a giant present--the perfect spot for a holiday photo-op. Four days. 92 volunteers. And 150 pounds of gingerbread. 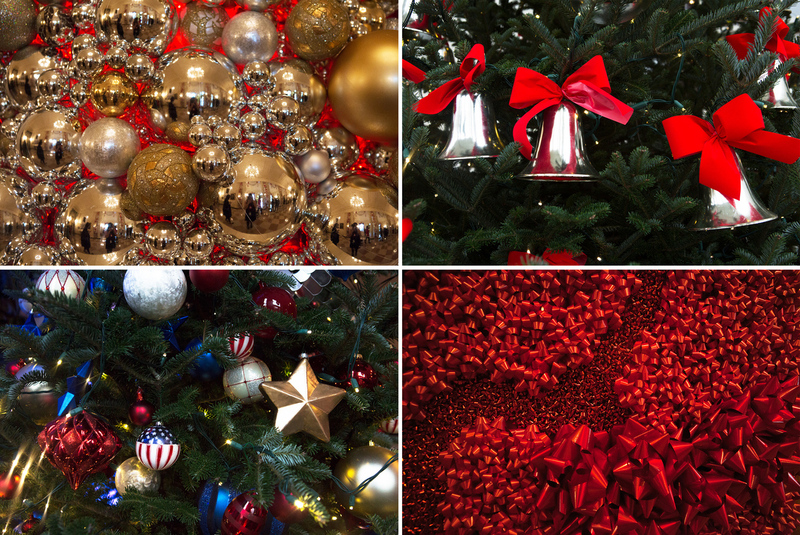 That's just part of what goes into decorating for the White House for Christmas. Volunteers went to work the day after Thanksgiving, stringing thousands of bow ribbons and crystal ornaments throughout the mansion. 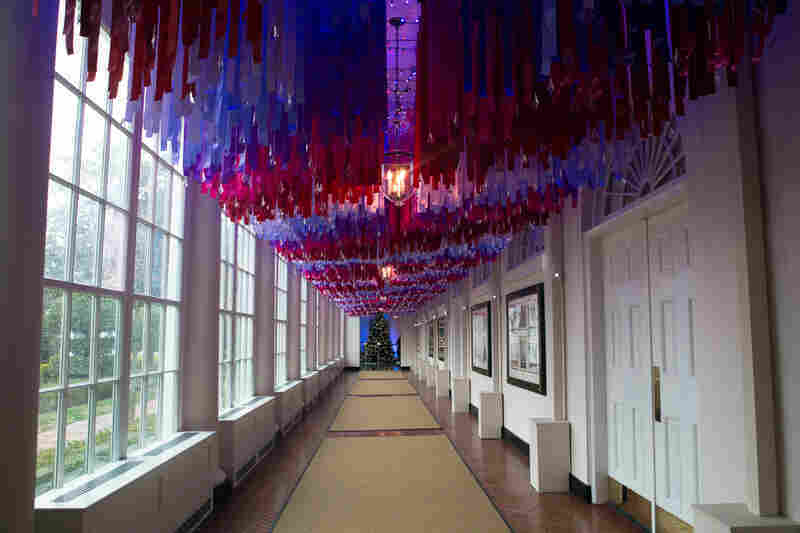 Military families got a sneak peak at the decorations this week. 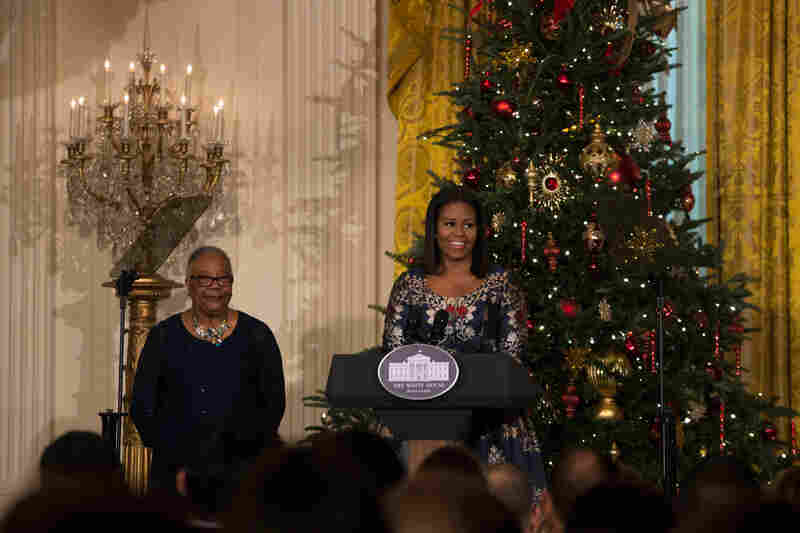 "As we celebrate my family's last holiday season in the White House, I'm thinking back to when we first came here to Washington and we promised to open up this house to as many people from as many backgrounds as possible," said First Lady Michelle Obama. "We truly wanted to make the White House the 'People's House,' particularly during the holiday seasons." A variety of ornaments and decorations hang throughout the house. 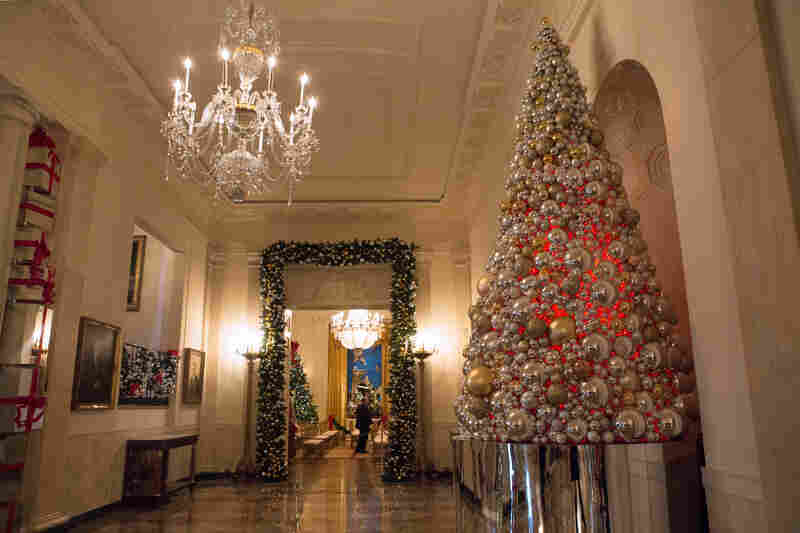 Most of the decoration designs this year use repurposed ornaments and embellishments that were already part of the White House holiday inventory. "This is something I've always thought about doing," said Diane Wright, who traveled from Watertown, Connecticut to join the decorating party. "I do my mom's tree for her, so it was more or less a tribute to my mother." Some of the volunteers are expert crafters. Others said they merely follow directions well. "Somebody has to be on the ladder. Somebody has to be hanging. Somebody has to be holding something," said self-described "worker bee" Julie Byrne. "You're always a member of something bigger." This year's White House Gingerbread House is made with 150 pounds of gingerbread, 100 pounds of bread dough, 20 pounds of gum paste, 20 pounds of icing and 20 pounds of sculpted sugar pieces. It also features both the East and West Wings.